Cover your ears! As noon approaches, music starts to play and the Castle's gunners march out. At 12 O'clock precisely, the order is given to fire and the sound of the shot echoes all around the town. 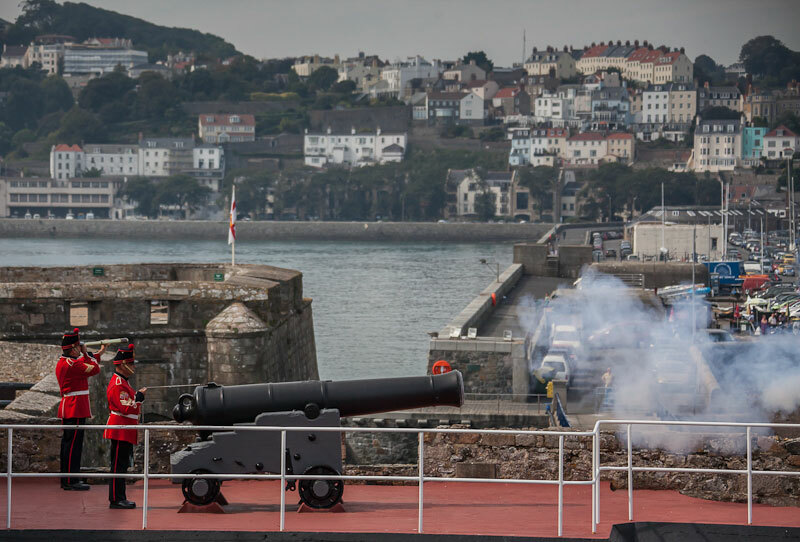 From at least the early years of the 19th century a gun was fired from Castle Cornet at noon and another at 21.30 to recall soldiers of the garrison to their barracks - the Curfew gun. Originally the gun was fired from the Cavalier Battery on the citadel. A 9-pounder gun was used, but this was later replaced by an 18-pounder. The gun was discontinued in 1923 as an economy measure. 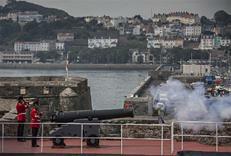 The Noonday Gun ceremony in Castle Cornet was re-introduced as a visitor attraction in 1974. The gun is 'fired' using a saluting charge of approximately 25 grammes. The charge is placed twelve to eighteen inches down the barrel of the gun and detonated electrically. The gun is also used on ceremonial occasions, including to mark the beginning and end of the 2-minute silence on Armistice Day. The "Noon-Day Gun" is a cast iron, smooth-bored 32-pounder, Blomefield pattern, cast by Carron Foundry in 1799. Its serial number is 60208, cast into the left hand trunnion, and it carries the arms of King George III. It has a calibre of 6.41 inches. In service the gun would have fired a 32 pound iron ball to an extreme range of about 2,500 yards. The gun is mounted on the only remaining original wooden garrison carriage in the castle. Its design is similar to that used on warships, but it has iron rather than wooden trucks (wheels). Both gun and carriage stood for many years on the Parade Ground at Les Beaucamps Arsenal. They were transferred to Castle Cornet in 1953.